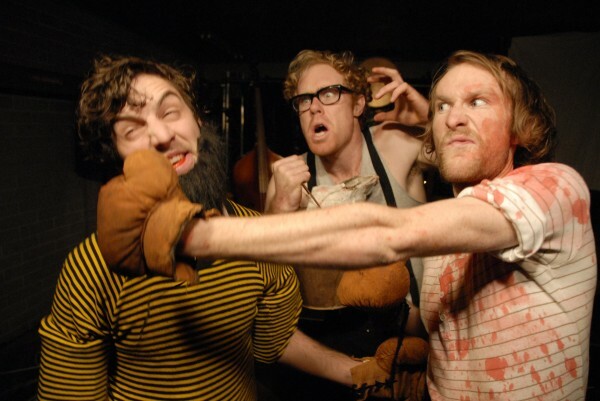 Madcap, junkyard comedy from the Aussie trio. In an Aussie shanty-town where the local abattoir doubles up as boxing emporium, Messy Dimes Dan, the butcher-promoter, is banking on Backbone Joe’s angry fists to sell his meat-fruit. Someone’s got their hands dirty, and detective Von Trapp is here with a note from a special lady that is bound to stir things up. Suitcase Royale’s The Ballad of Backbone Joe is a Dixieland feast, like a Looney Tunes version of The Maltese Falcon. The Australian trio’s show blends visual theatre and smokehouse blues; film noir animations, slapstick comedy and musical interludes are smoothly woven together so that the show never feels like a series of comedic sketches, rather a coherent and deliberately cacophonous whole. It’s as if the guys next door have recycled the contents of your garden shed to stage a version of their favourite noir thriller and dedicated the results to Nick Cave. The plot might be secondary, but Joseph O’Farrell, Miles O’Neil and Glen Walton never resort to caricature and have a genuine love of tomfoolery. The ramshackle set doubles up as a projection screen, the characters intervene in their own animations and props are used imaginatively, a suitcase easily turned into a convertible car. The trio reveal the hidden mechanics of the show by bringing on their own props from off-stage, by adjusting the lighting themselves and by commenting on each other’s performances. It’s this quality that makes the show so theatrical. It also means that when things go wrong – and the three make sure they do – the process of rescue becomes a scene in itself. The theatricality never overshadows the comedy, but it allows the performers to glide in and out of character, intervene in their own set-up and never fully commit to their charmingly gritty stage personas. The production also benefits from a strong narrative thread, borrowing its structure from the world of film noir. In this sense it’s very cinematic, but the motivations and relationships between the characters are very much the domain of theatre. In fact, there’s a constant blend of the theatrical with the cinematic; the trio employ a variety of storytelling techniques and then break their conventions – walking through films, breaking out of character, and even breaking one of their puppets in the process, a moment which the audience loved. This madcap content has been blended with music which gives the production a unique flavour. Suitcase Royale are excellent musicians with their home-made banjos and junk-yard contra-bass, and the confidence of these musical interludes provides a nice balance with the wacky comedy. The Ballad of Backbone Joe is a hilarious blend, merging performance and animation with a junkyard aesthetic, flexing and toying with form, carefully mingling things together. Suitcase Royale are scratching new work at the BAC in July and I can’t wait to see what’ll come from them next. Suitcase Royale will be at Soho Theatre until 16th July and then at the BAC with their Scratch performance, Suitcase Royale in Zombieland, from the 21st – 30th July 2011.